Do you want to learn more on Aries and Pisces compatibility? Then you have just come to the right place. Check it out. A couple formed by Aries and Pisces has little compatibility. But before checking the compatibility, let us check more about each of the signs. Aries faces the difficulties of life as a warrior and this explains the basis of his temperament. Pisces belongs to the element Water and Aries belongs to the element Fire. Aries has initiative, is a sign that, by its nature, loves to draw attention. This contrasts with the humility that characterizes Pisces. Fire and Water is actually a quite strange blending. With some other factors aligned, they could work it out. But it is basically hard to reconcile the differences between these two elements. Aries, the fiery partner, will find Pisces, the watery partner, too emotionally exhausting. By its way, Pisces, the Water partner, could put out the fire of Aries. 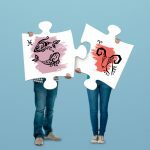 Aries and Pisces compatibility: how will the relationship work? Aries and Pisces have totally different personality characteristics. This is due to the fact that Pisces is the last sign of the zodiac and Aries is the first. Aries stands out for his skills and likes to measure strength with his partner. The Pisces individual is very dedicated and willingly sacrifices himself to let the Aries individual win a given contest. However, the energetic attitude of Aries turns out to be excessive, causing the individual of Pisces sign to feel somehow put apart and devalued. The fire ends with the water. Their paths are quite different. Communication is a very important factor for the success of a loving relationship. Aries communicates energetically and defends his views with great vigour, while Pisces has more of a passive and peaceful communication. This relationship is based on an antagonism and, therefore, compatibility is low. If both make a great effort, it is possible to make the relationship last longer. Perhaps a loving relationship is more likely than a friendship, since with the birth of a genuine feeling, it will be easier to manage the great differences that exist between Aries and Pisces. The intimate relations between Pisces and Aries have several contrasts. While Aries is very fast in his actions, Pisces is carried away by the fantasy of the energetic moment in which the sexual encounter takes place. The good will of both of them can overcome the problems of understanding that will always exist between those born under these two signs.